People spend months, even years, considering just the right name for a baby, so why not put that same energy into choosing Akita names for a new puppy? Okay, chances are you don’t have months to put into naming a new fur-baby, but that doesn’t make the task any less essential. Names are more than just a label. A name can be a superpower you give your new puppy, one that will last a lifetime. It’s an important choice because the name will mean something to the dog, too. This is a word your new puppy will respond to millions of times throughout life. You’ll use it every time you call your dog to go for a walk, make an introduction to a new friend, human or canine, or just cuddle on the couch. You don’t yell, “Come here new puppy” when you want to play, or “Hey, dog, it’s time to go outside”. Naming gives your pet an identity to grow into and learn to love. So, what are you going to name your new Akita puppy? Maybe we can make a few suggestions to get you started on your path towards the best name for your new best friend. Let’s start with some basic rules for naming all dogs whether it’s an Akita puppy or not. The first rule is there are no rules, not real ones, at least. We prefer to call them guidelines because there are so many variables involved. Ultimately, choosing a name for a pet boils down to personal preference and whatever inspires you. Don’t name your new Akita puppy after a living family member or close friend, For example, if your dad’s name is Fred and dad lives with you or is visiting, calling “Fred, come here” is going to be confusing for everyone in the room. Pick something more distinctive, so it stands out. 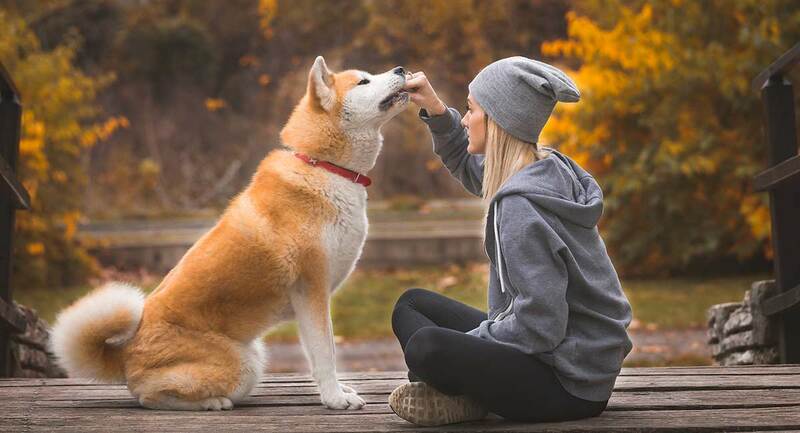 Follow the KISS strategy for Akita names – Keep it simple stupid. Avoid complicated names with multiple syllables, because you want something the dog will remember and that rolls off your tongue. Long names mean lots of possible nicknames, too and that’s also confusing for everyone. Avoid words that you will use as training cues, because, yeah, that’s confusing, too. Stay away from names that are possibly offensive because nobody needs that problem. If you wouldn’t say the word to your mother, it’s not a good choice for your dog. It is important to pick your puppy’s name within the first two weeks, too, so your pet can have some time to adjust to it. The Akita is a robust and proud breed of dog with an impressive heritage, one that dates back to early 17th century Japan. It might make sense that you might want to celebrate that heritage with one of many proper Akita names. You can factor gender into the name choice, as well. Maybe gender is just as important to you as heritage. Of course, you can go with a standard girl dog name, too. Try a few of those out to see which of these female Akita names your new puppy seems to like best. Maybe you want Akita names that don’t have anything to do with either heritage or gender. Sometimes the way your Akita puppy looks can point you in the right direction for a name. After all, you wouldn’t call a black and white dog called ‘Pumpkin’ – that’s crazy. Cute can be about personality, too. No rule says you can’t assign your new puppy a unique dog name that has more impact. This list could go on forever, but you get the idea. Think about what movie you love or TV show you can’t do without and pick a name from it. It’s up to you to choose the perfect name for your new Akita puppy. There are really no wrong choices as long as both you and the dog love it. Your goal is to pick a name that inspires you whether it comes from a favorite TV, a pet you loved once upon a time or just something that feels right. Play around with different name and see what works and what doesn’t for your dog, too. After all, it is as much the dog’s decision as it is yours, right? Run by them one by one and see which name gets your Akita’s attention, especially if you are stuck on a few and can’t make a final choice. Personality, appearance and a little bit of creativity can guide you as you give your new Akita puppy a forever name.